A Massive Open Online Course, or MOOC, is an online course that offers open access via the Internet for free or at a low cost. Many MOOCs are modeled after existing college or university courses, but unlike these courses, most MOOCs do not count for college credit. There are some exceptions, however, with a few providers offering certificates of completion if students take proficiency exams, or partnering with more traditional online programs to offer for-credit courses. What else defines a MOOC? As their name suggests, many MOOCs have huge class sizes, with the largest on record topping out at over 300,000 students. Another important element of a MOOC is open licensing. This can apply not only to the course itself, which offers open enrollment, but also to much of the content, structure, and resources employed by the course, allowing anyone, anywhere to sign up and take the course. Anyone who wants to sign up for a MOOC can and the majority of courses take place asynchronously, allowing students to study when and where it’s most convenient for them and also expanding accessibility to students anywhere in the world. Because they are free, it’s not uncommon for students to sign up for but not to complete a MOOC—there are no penalties. Concurrent enrollment is also common, as students can sign up for as many MOOCs as they want, from as many different providers as they want. The content of MOOCs differs very little from traditional online courses but each MOOC is unique and the look and feel of the MOOC will often depend on the topic and instructor. Unlike online courses, however, the sheer size of MOOCs makes it impossible for instructors to respond to students individually so students must rely on their own motivation to stay on track and on other classmates in a MOOC for help with homework, studying, and even evaluation. Depending on who you ask, MOOCs will be praised as the next big transformative movement in education or brushed off as over-hyped and already on the decline. Where does the truth lie? As it generally does, somewhere in between. Here’s a look at some of the pros and cons of today’s MOOCs. The Pros: MOOCs make it possible for a large number of students to access educational opportunities at no or very low cost, democratizing access to education in an age when high college tuition makes attending school difficult for those without financial means. For those who are driven and can self-motivate, they can be an excellent way to refresh knowledge, learn new skills, or to simply engage in a topic of interest on a nearly limitless array of topics. The Cons: One of the biggest problems with MOOCs is failure of students to actually complete them. A study by MIT and Harvard found that more than 95 percent of students dropped out of their MOOC before the session was over, a rate that’s almost unheard of in traditional online education. Why the mass exodus from the courses? The most commonly cited reason is a lack of live teacher engagement, whether through class discussion or through feedback on course assignments. While the end goal of many MOOCs is knowledge, not a degree, stats show that without teacher support, curiosity alone isn’t enough to sustain most students. What’s the Next Decade Going to Look Like for Them? The first MOOC was launched in 2008 as an experiment by two Canadian educators. Since then, MOOCs have grown enormously, both in the number of students who take them and in variety. Take Coursera for example, one of the better known MOOC providers. In less than two years, it enrolled more than 1.7 million students and garnered partnerships with more than 30 top names in higher education, like Princeton, Columbia, and Duke. To date, it has enrolled almost 12 million students. It’s not alone in the mad dash to embrace MOOCs. Over the past seven years, Google has released a MOOC-building tool allowing anyone to build a MOOC and numerous other large-scale providers have emerged including Udacity and and edX, offering highly innovative and incredibly popular courses taught by educators at top universities from around the world. Despite the rapid rise in MOOCs, the format is still evolving and looking for ways to solve many of the problems that critics have pointed to as major stumbling blocks. While many predicted that the MOOC would fizzle out, even as far back as 2012, the format is still going strong, though perhaps not being the darling of higher education that it once was. Over the next decade, MOOCs are likely to look for ways to improve teacher engagement and to offer greater opportunities for credit and certification, though this may also mean that many MOOCs move from being free to requiring students to pay tuition. While their demise has been predicted almost since their inception by the mode’s critics, it’s likely that MOOCs will be around for some time to come. While it’s unlikely that MOOCs will ever be the game-changer they were initially touted to be, MOOCs will still have an important role to play in the future of online education. There are a few major ways that these free, open courses can be of use to you. Be a student. Curious about what a MOOC is really like? Sign up for one. Not only will you will learn more about the format (critical if you want to build your own MOOC someday), but you’ll get a chance to learn about a topic of interest at no cost to you. It can be a great way to do some professional development and engage with the online learning environment with no penalty, monetary or otherwise, should you get too busy to complete it. Use MOOCs to inform your own teaching. MOOCs have their pros and cons, both of which can be used to help you fine tune your own approach to online teaching and learning. Develop your own MOOC. Want to share your expertise and research with the world? MOOCs are one way to do it. Launching a MOOC can be a lot of work, but because MOOCs are not for-credit, they are significantly easier to create than a traditional online course. Some MOOCs have been launched in conjunction with the publication of research, or because faculty members have knowledge in fields that aren’t always easy to find traditional courses in. Even better, MOOCs don’t have to span an entire semester—some MOOCs are only comprised of a few shorter seminars than can span a few days or a few weeks. If you want to learn more about crafting a MOOC, visit Learning Technologies. We can help you to develop your course content, better understand the intellectual property issues that may arise, and find the best forum for launching your course. There’s a lot of information out there on MOOCs. These resources can help you to learn more and find out where to take some exciting new free, open online courses. What Campus Leaders Need to Know About MOOCs: This Educase briefing provides a great overview of MOOCs and highlights the key things educators need to know about them. 5 Myths About MOOCs: Think you know what MOOCs are all about? This article from Times Higher Education in the UK dispels some of the most common myths about these online courses. 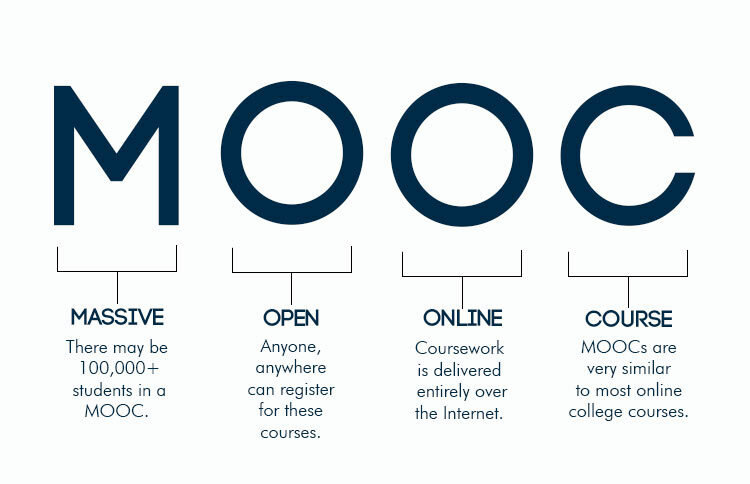 MOOCs 101: In this video, you can learn more about the basics of MOOCs. MOOC List: This site makes it easy to search or browse through MOOCs from all of the major providers. This entry was posted in Glossary and tagged MOOCs. Bookmark the permalink.